So I originally wrote this post on Sunday! Sunday! Can you believe it that I was AHEAD schedule on posting. But then I had computer/camera problems and after 4 days of non-stop tinkering and very little patience I was able to get my pictures from my camera to the computer and from the computer to my blog. I guess better late than never! I like to learn new things all the time. Ever since I was a little kid I was always trying new things… gymnastics, Girl Scouts, swimming, violin, piano, choir, etc, etc. I have also applied that to cooking and baking. I am constantly trying new techniques and equipment. I also want to learn how to make various things; like cheese, homemade granola bars, various cakes, and breads, etc., etc. Now granted I learned a very in-depth knowledge and how to make a great deal of things in culinary school; but there are still things I am learning. That is one reason why I was interested in doing this cookbook as the cookbook of the month. Not only did it have basic recipes for pork and chicken but it also had things like pumpkin soup, and these sesame crackers. Now you might say why would I want to go to all the trouble to make my own crackers from scratch (how Martha of me) but I have never made homemade crackers from scratch so why not! They were really not that difficult, just like making cookies and they were full of flavor. Great with the hummus I posted yesterday, or with cheese or dip. Preheat oven to 350 degrees. Put the flour, 2 tablespoons sesame seeds, the lemon rind, thyme, salt and pepper in bowl. Cut in the butter using fork or pastry blender until mixture resembles bread crumbs. Gradually stir in water until mixture forms dough. Turn mixture onto lightly floured surface and roll out thinly. Using a 2 inch round cookie cutter**** cut the dough into rounds and place on baking sheets, which has been lightly sprayed with non-stick spray. 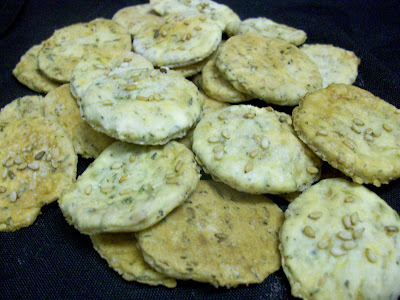 Brush the crackers with the egg white and sprinkle with the remaining sesame seeds and a little salt. Bake for 20 minutes, until lightly browned. Store in an air tight container. ****I have a big ‘ole box of cookie cutters that my mom gave me for Christmas a few years ago but it did not have a circle cutter small enough for crackers. So, I just improvised and used the lid to one of my spices… bam the perfect size! « He Really Does Listen!